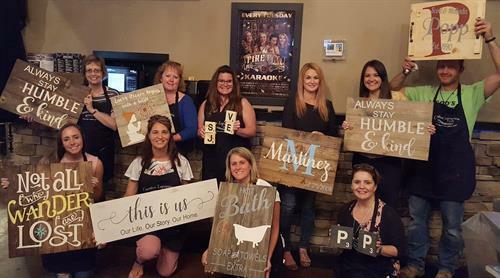 These wooden signs you craft are unique, fun, & beautiful! You Must pre-register to have your personalized materials prepared for you. You will take home a wonderful piece that you created! Go to the website and choose from any of our designs or have us custom design something for you! You Must PRE-REGISTER!! Check out the Gallery page on our website to see designs and prices. Cost depends on size of sign ranging from $50- $120. Custom designs may cost $20 more for design time. Please check out the Gallery page on our website to see designs and prices. Sunday, February 17 from 1 p.m. to 3 p.m.